Arithmetic Logic Unit (ALU): Performs numerical calculations and comparative logic functions, such as ADD, SUBTRACT, DIVIDE, and MULTIPLY. 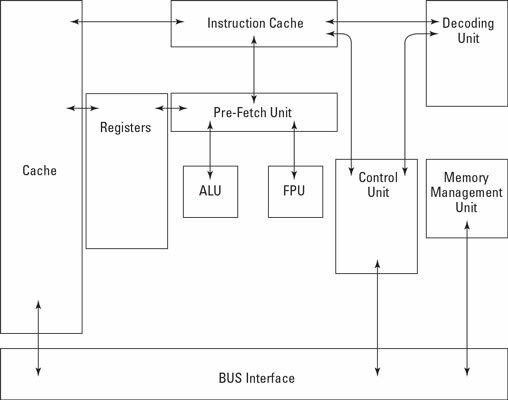 Bus Interface Unit (BIU): Supervises data transfers over the bus system between the CPU and I/O devices. Control Unit: Coordinates activities of the other CPU components during program execution. Decode Unit: Converts incoming instructions into individual CPU commands. Floating-Point Unit (FPU): Handles higher math operations for the ALU and control unit. Memory Management Unit (MMU): Handles addressing and cataloging data that’s stored in memory and translates logical addressing into physical addressing. Pre-Fetch Unit: Preloads instructions into CPU registers. Protection Test Unit (PTU): Monitors all CPU functions to ensure that they’re properly executed. Registers: Hold CPU data, addresses, and instructions temporarily, in special buffers. The basic operation of a microprocessor consists of two distinct phases: fetch and execute. (It’s not too different from what your dog does: You throw the stick, and he fetches the stick.) During the fetch phase, the CPU locates and retrieves a required instruction from memory. During the execute phase, the CPU decodes and executes the instruction. These two phases make up a basic machine cycle that’s controlled by the CPU clock signals. Many complex instructions require more than a single machine cycle to execute. Operating (or run) state: The CPU executes an instruction or instructions. Problem (or application) state: The CPU calculates a solution to an application-based problem. During this state, only a limited subset of instructions (non-privileged instructions) is available. Supervisory state: The CPU executes a privileged instruction, meaning that instruction is available only to a system administrator or other authorized user/process. Wait state: The CPU hasn’t yet completed execution of an instruction and must extend the cycle. Complex-Instruction-Set Computing (CISC): Can perform multiple operations per single instruction. Optimized for systems in which the fetch phase is the longest part of the instruction execution cycle. CPUs that use CISC include Intel x86, PDP-11, and Motorola 68000. Reduced-Instruction-Set Computing (RISC): Uses fewer, simpler instructions than CISC architecture, requiring fewer clock cycles to execute. Optimized for systems in which the fetch and execute phases are approximately equal. CPUs that have RISC architecture include Alpha, PowerPC, and SPARC. Multitasking: Alternates the execution of multiple subprograms or tasks on a single processor. Multiprogramming: Alternates the execution of multiple programs on a single processor. Multiprocessing: Executes multiple programs on multiple processors simultaneously. Multistate: The operating system supports multiple operating states, such as single-user and multiuser modes in the UNIX/Linux world and Normal and Safe modes in the Windows world. Multiuser: The operating system can differentiate between users. For example, it provides different shell environments, profiles, or privilege levels for each user, as well as process isolation between users. An important security issue in multiuser systems involves privileged accounts, and programs or processes that run in a privileged state. Programs such as su (UNIX/Linux) and RunAs (Windows) allow a user to switch to a different account, such as root or administrator, and execute privileged commands in this context. Many programs rely on privileged service accounts to function properly. Utilities such as IBM’s Superzap, for example, are used to install fixes to the operating system or other applications. Data bus: Transmits data between the CPU, memory, and peripheral devices. Address bus: Transmits addresses of data and instructions between the CPU and memory. Control bus: Transmits control information (device status) between the CPU and other devices. Dynamic RAM (DRAM): Must be refreshed (the contents rewritten) every two milliseconds because of capacitance decay. Refreshing is accomplished by using multiple clock signals known as multiphase clock signals. Static RAM (SRAM): Faster than DRAM and uses circuit latches to represent data, so it doesn’t need to be refreshed. Because SRAM doesn’t need to be refreshed, a single-phase clock signal is used. Programmable Read-Only Memory (PROM): This type of ROM can’t be rewritten. Electrically Erasable Programmable Read-Only Memory (EEPROM): This type of ROM was one of the first that could be changed without UV light. Also known as Electrically Alterable Read-Only Memory (EAROM). Flash Memory: This type of memory is used in USB thumb drives. Be sure you don’t confuse the term “main storage” with the storage provided by hard drives. Secondary memory (also known as secondary storage) is a variation of these two basic types of physical memory. It provides dynamic storage on nonvolatile magnetic media such as hard drives, solid-state drives, or tape drives (which are considered sequential memory because data can’t be directly accessed — instead, you must search from the beginning of the tape). Virtual memory (such as a paging file, swap space, or swap partition) is a type of secondary memory that uses both installed physical memory and available hard-drive space to present a larger apparent memory space to the CPU than actually exists in main storage. Two important security concepts associated with memory are the protection domain (also called protected memory) and memory addressing. A protection domain prevents other programs or processes from accessing and modifying the contents of address space that’s already been assigned to another active program or process. This protection can be performed by the operating system or implemented in hardware. The purpose of a protection domain is to protect the memory space assigned to a process so that no other process can read from the space or alter it. The memory space occupied by each process can be considered private. Base addressing: An address used as the origin for calculating other addresses. Absolute addressing: An address that identifies a location without reference to a base address — or it may be a base address itself. Indirect addressing: The specified address contains the address to the final desired location in memory. Direct addressing: Specifies the address of the final desired memory location. Don’t confuse the concepts of virtual memory and virtual addressing. Virtual memory combines physical memory and hard drive space to create more apparent memory (or memory space). Virtual addressing is the method used by applications and programmers to specify a desired location in physical memory. Firmware is a program or set of computer instructions stored in the physical circuitry of ROM memory. These types of programs are typically changed infrequently or not at all. In servers and user workstations, firmware usually stores the initial computer instructions that are executed when the server or workstation is powered on; the firmware starts the CPU and other onboard chips, and establishes communications by using the keyboard, monitor, network adaptor, and hard drive. The firmware retrieves blocks of data from the hard drive that are then used to load and start the operating system. A computer’s BIOS is a common example of firmware. BIOS, or Basic Input-Output System, contains instructions needed to start a computer when it’s first powered on, initialize devices, and load the operating system from secondary storage (such as a hard drive). Firmware is also found in devices such as smartphones, tablets, DSL/cable modems, and practically every other type of Internet-connected device, such as automobiles, thermostats, and even your refrigerator. Firmware is typically stored on one or more ROM chips on a computer’s motherboard (the main circuit board containing the CPU(s), memory, and other circuitry). Software includes the operating system and programs or applications that are installed on a computer system. A computer operating system (OS) is the software that controls the workings of a computer, enabling the computer to be used. The operating system can be thought of as a logical platform, through which other programs can be run to perform work. Kernel: The core component of the operating system that allows processes, control of hardware devices, and communications to external devices and systems to run. Device drivers: Software modules used by the kernel to communicate with internal and external devices that may be connected to the computer. Tools: Independent programs that perform specific maintenance functions, such as filesystem repair or network testing. Tools can be run automatically or manually. Process management: Sets up an environment in which multiple independent processes (programs) can run. Resource management: Controls access to all available resources, using schemes that may be based on priority or efficiency. I/O device management: Controls communication to all devices that are connected to the computer, including hard drives, printers, monitors, keyboard, mouse, and so on. Memory management: Controls the allocation and access to main memory (RAM), allocating it to processes, as well as general uses such as disk caching. File management: Controls the file systems that are present on hard drives and other types of devices and performs all file operations on behalf of individual processes. Communications management: Controls communications on all available communications media on behalf of processes. A virtual machine is a software implementation of a computer, enabling many running copies of an operating system to execute on a single running computer without interfering with each other. Virtual machines are typically controlled by a hypervisor, a software program that allocates resources for each resident operating system (called a guest). A hypervisor serves as an operating system for multiple operating systems. One of the strengths of virtualization is that the resident operating system has little or no awareness of the fact that it’s running as a guest — instead, it may believe that it has direct control of the computer’s hardware. Only your system administrator knows for sure. A container is a lightweight, standalone executable package of a piece of software that includes everything it needs to run. A container is essentially a bare-bones virtual machine that only has the minimum software installed necessary to deploy a given application. Popular container platforms include Docker and Kubernetes.